GreenPRO: A novel fertiliser-driven osmotic power generation process for fertigation has been publiished in Elsevier journal Desalination (Volume 447, 1 December 2018, Pages 158-166). This study introduces and describes GreenPRO, a novel concept involving fertiliser-driven osmotic energy generation via pressure retarded osmosis (PRO). The potential of GreenPRO was proposed for three objectives: (a) power generation, (b) water pressurisation for fertiliser-based irrigation, and (c) water treatment, as a holistic water-energy-food nexus process. Three pure agricultural fertilisers and two commercial blended fertiliser solutions were used as the draw solution and irrigation water as feed to test this concept for power generation. Theoretical thermodynamic simulation of the maximum extractable Gibbs energy, was first performed. After which, a series of bench-scale experiments were conducted to obtain realistic extractable energy data. The results showed that concentrated fertilisers potentially have 11 times higher energy than seawater. Even after accounting for the irreversibility losses due to constant pressure operation, the investigated pure fertilisers were found to have between 2.5 and 4.6 Wh/kg of energy. The outcomes from the flux and power density modelling were then validated with real experimental data. This study has successfully demonstrated that concentrated fertilisers can release a substantial amount of chemical potential energy when diluted for fertigation. This energy could be harnessed by transforming it into electric energy or pressure energy via PRO. 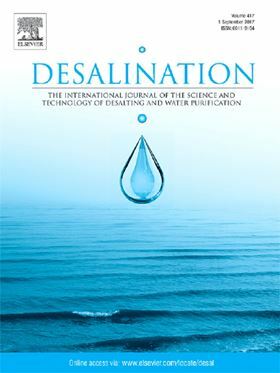 An assessment of solar thermal-powered desalination technologies in order to identify key issues.